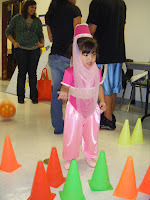 As you can see she made a darn cute Jeannie, if I do say so myself. Everyone thought she was so adorable and there wasn't another Jeannie in sight which always makes me happy. She had so much fun as usual. This kid really enjoys events and activities. She just jumps right in. 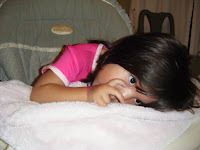 Here she is before we left the house right after her nap and lunch. We first got her picture taken at a local photo studio that was doing drop in Halloween pictures. I figured I'd try that before with the hopes of getting one good one with her hat on. The only problem is she was more scared of the studio than she was anywhere else. 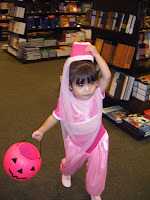 I deliberately didn't take her anywhere set up for older kids or where there would be "scary" things because she's been freaking out at stores since the Halloween stuff has been out (which was like Valentines Day right!) 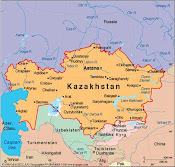 Anyway, after that we went first to a small local mall to meet some friends and see how she would do. She was pretty timid at first but very quickly warmed up to it and would even say "kik -oh-kret" and always "hank u." Very sweet. Here she is looking like she was begging "please sir, may I have some more?" I do feed this child. And the HAT...it was a pain from the beginning. 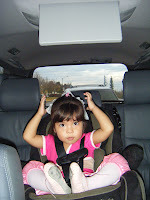 She didn't want to wear it for the longest time. 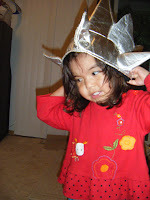 My child who won't sit on her potty chair without a hat on wouldn't wear the hat whenever I tried the costume on her or we practiced Trick or Treating. I also have been rigging it since I got it in the mail 6 weeks ago. The hat they sent was just cloth so I have stitched and then stapled cardboard in it and then added a neck strap to keep it on but of course she was pulling it off or it got caught or whatever. 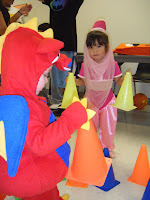 But the hat is what makes the costume so I actually ended up bribing her to wear it. I swore I was never going to be one of "those" moms and there I was in the parking lot of the mall telling her they wouldn't give her any candy if she didn't wear the hat. So wait, that makes me a liar as well because I had to give her an "M" to get her to keep it on. Bad Mommy! 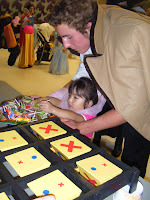 Next we were off to the community center here in Port Orchard that has games set up for the little ones to play. Lexie LOVED LOVED LOVED it!!! 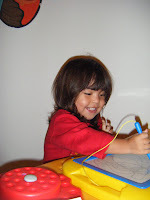 Of course she didn't play by the rules but she was so cute no one cared. It was very nicely set up with a local youth group running most of the games. Lexie liked that they were "kids" and she got help from a lot of them. 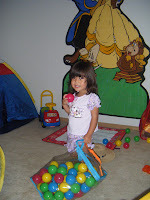 She also decided that rather than throw a ball at the cones that she would simply re-arrange them and before you know it she had another little boy joining in. She really enjoyed doing the "cake" walk (they gave out prizes instead of cakes thank goodness) and she would just jump in the middle of the game and follow around whenever she'd see the kids walking on the numbers. 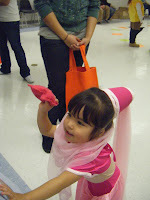 The "fish" for candy in the colored paper was a big hit too. As you can see from the golfing pictures, a Tiger Woods she's not. 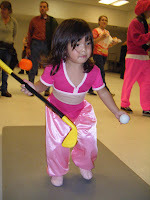 At one point it seemed that she thought a few extra clubs might help her game...not! 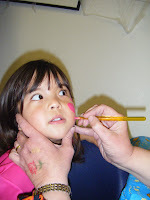 She couldn't get enough of the face painting. This very kind older lady did it and Lexie just kept turning her face to have another one done or when we left she would go into a room and then go back to her again. That's when she put the "flaw flaw" on her hand because she had run out of room on her cheek. 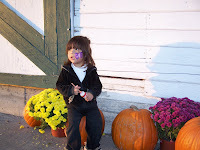 It was very sweet and the lady could actually paint unlike the young girl who did her at the pumpkin patch. 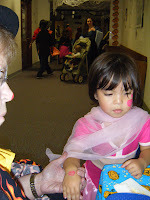 By our third trip to the face painting table I was dragging and so was her hat. It was more than time to go but my little party animal really didn't want to. I did resist bribing her once again and just put her coat on and left as quickly as possible. 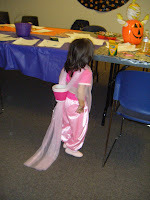 Over 5 hours of Halloween fun was more than enough for my little two year old Jeannie even if she didn't know it. A quick late dinner and she was crashed the minute her little head (minus the hearts) hit the pillow. 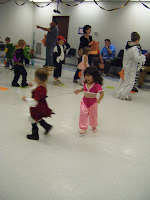 PS - I had to include the picture of Lexie at her dance class on Wed since they all were encouraged to wear their costumes. Aren't they all adorable!! Since Mom moved out it seems like all I've been doing is trying to get caught up. It's certainly harder to do that without Mom's help with Lexie when she's not in daycare. Lexie's old enough now to want to "help" me with everything so of course nothing gets done while she's awake. So I'm trying to get the blog caught up at night and then I'll make an effort to not get as far behind in the future. We'll see. 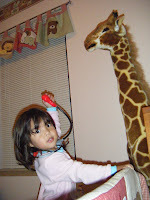 After mom left I converted her bedroom back to a guest room and her living room into Lexie's playroom. 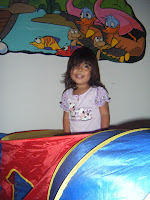 It's been nice to have more room for Lexie to play in and to get a lot of the toys out of the living room upstairs (we still miss you Mom and Lexie always checks your room to see if you have magically appeared.) 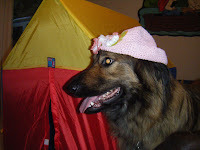 As you can see she has made herself right at home and now the dogs are getting in on her hat act. Between her checking their hearts and dressing them up I have a feeling they wish I hadn't expanded her play area so that it includes them. Life moves on and we are back for our second season of dance class. This year it's Lexie in class all by herself. I wanted to do the Mommy & Me again since the regular classes start at age 3 and Lexie was only 28 months when they started up again. But the Mommy & Me class is being held on Friday at 2pm so there was no way I could commit to that time. Plus once I let her try this class on her own she's done great. She still loves her teacher and the other girls are a little older than Lexie but almost all of them haven't had any dance so Lexie is actually the "pro" in the class. Okay that's a bit of a stretch but she is very confident in both ballet and tap which makes up for the fact that she's so young. Bottom line is she is still loving it and I get to watch her have fun. Isn't the picture adorable of the 4 ballerinas waiting to start class? 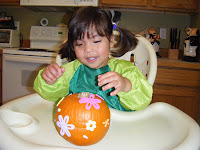 Then we were on to Halloween prep. 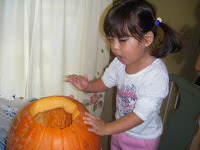 She really enjoys her plastic pumpkins which we are practicing with for the whole trick or treat thing but the real pumpkin insides grossed her out. As soon as she touched it she was way done. 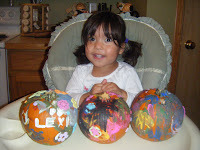 Luckily I had her paint her pumpkins first. That she loved. I think she feels like she's some kind of real artist. 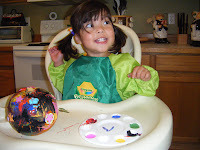 She was very serious and took her time with the paints. And the first one she put the stickers on first then paint over it and the second one she only wanted paint. 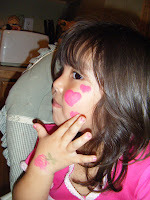 After they dried and we went to put stickers on top of the paint she did not want anything on the last one. I put one on just to see and she very firmly said no and took it off. She certainly knows what she wants and is very proud of her work! And her she is with the end results. Ta daaa!!! 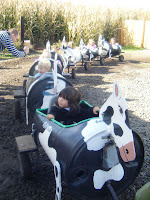 The next day we were off to a fabulous day at the pumpkin patch, corn maze and so much more. 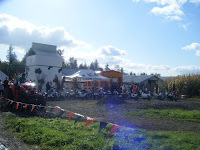 The weather was terrific and Maris Farms looked picture perfect. 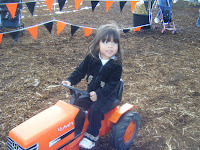 They had a whole area just for the little kids with steer roping (which Lexie choose to ride instead), tractor races (which Mommy got to be the motor for the tractor), duck races, pig races and even a cow train pulled by a real tractor. This place was a hoot and Lexie & I had one to boot! 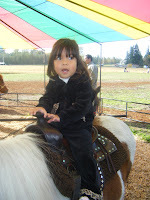 Next we were off to the pony rides for Lexie's first time on one. As soon as she say them she said "Me..me..me" so there was no question of her being scared or anything. She got right on when it was her turn and only had a moment of uncertainty when the pony first moved but then she was fine. Smiling the whole time. 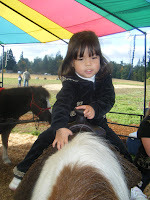 She even thanked the pony when we were done. 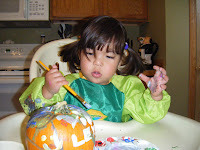 Her Aunt Yin-Yin and Uncle Todd would have been so proud. 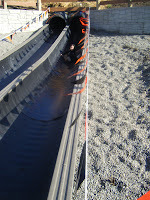 Then my little dare devil saw this big slide that had been built into the hill with a huge plastic pipe as the slide and she ran right for it. 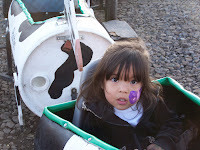 At first I was going to go with her but I saw a couple of younger kids going on it by themselves and she keep saying "me go, me go" so I thought what the heck. She amazed me and just zipped right down it and wanted to go again. She is going to be a wild thing at the amusement parks. They also had this big blow-up thing that was dug into a sand pit. Kind of like a trampoline that was on the ground the size of a tennis court. 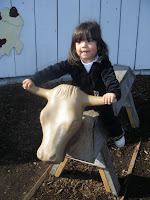 Lexie had a hard time waiting in line for that one be there was no question she was going to jump on it. 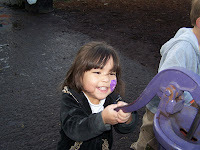 When it was her turn there where a lot of older kids who bounced her all over the place but she had a ball. I just wished I'd brought the video camera. She was laughing the whole time she was in there. There was also a petting area so she got to pet her first bunny. Very sweet. 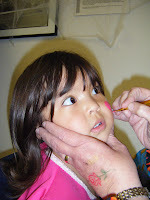 And then we were back to the little kid area again to get her face painted, also a first. I'm glad we waited to the end since the young girl who did it was no Rembrandt. It was a very large purple butterfly if you can't tell what it is. 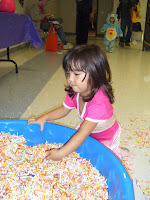 But I think the coolest thing they had was a corn pit. 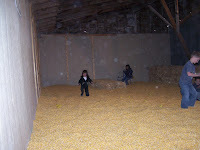 It was a huge room in a barn filled about 2 feet deep with dried corn kernels. The kids just jumped in and rolled around in it and had a ball. Adults where allowed in with them and it felt like you where getting a message on your feet. It was great and Lexie didn't want to get out. All and all we had a great day! !